This week, we finished our music-themed term, concluding with our end-of-term concert. The concert showcased the many and varied musical talents of PLACE youngsters and featured singers, string players, percussion, guitar and keyboards. The performers covered a wide range of ages, including one as young as four. During the concert, we were joined by the Kitchen Choir (who raised the age range considerably). Many thanks to the ladies of the choir for joining us and doing so much to inspire the youngsters. Also, special thanks to Hazel Farrow, our resident music tutor, for making it all happen. 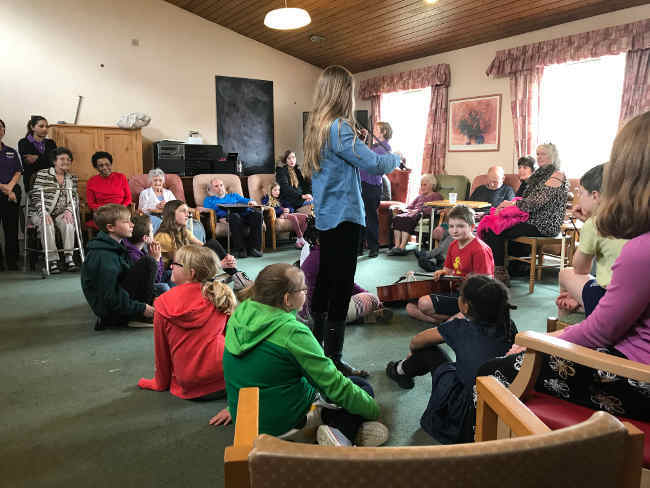 After our end-of-term concert, we gave a performance to the residents of Southway Residential Home.